It was cold: -10C when I went flying yesterday. During preflight, I found an inspection cover was missing, and looked like it had broken off. The screws were still there and I could see marks in the paint where it looked like it probably flapped around before it departed the aircraft. I wasn't sure if the airplane was airworthy in that state, and even though I thought I was probably overreacting, I stopped and asked. The cover was on the underside of the horizontal stabilizer and you would only see it if you crouched down low and really looked. I wonder how many flights took place with it like that. The chief instructor told me that I couldn't legally fly in that condition, but that it wasn't a safety issue. He fixed it, and a few minutes later I started the engine and taxied out. These guys keep their aircraft in great shape and I never worry about their airworthiness due to maintenance. I do, however, worry about a renter pranging an airplane, not telling anyone, and then leaving it for me to discover at 100' AGL, so I take the preflight seriously. I was content with my meticulousness in this instance, rather than being laughed at for being overly picky. The engine was fine during the run-up. I pulled up to the hold-short line and saw a fox running around in the grass beyond the runway threshold. I started my takeoff roll on 34L and noticed the oil pressure needle jump off the high side of the scale. I aborted the takeoff and taxied back to the run-up area. The engine was not warm enough and the oil was still to thick, I guess. I did another run-up and all was well. Afterward, I was told that it would have been OK to just go ahead with the takeoff. I'll file that fact away for later. Running late, I decided to stay in the pattern. There was about a 5 knot crosswind from the right--it is rare that I've flown in Northeast winds. I made some pretty decent landings, by my standards, and I tried especially to hold the crosswind correction during the landing flare. Afterwards, we got the IACRA stuff sorted out. It turns out that I hadn't actually submitted the application, which was the root cause of the problem. We scheduled the checkride for Sunday afternoon. I pored over the forecast that evening: 12 gusting 21 knots from the northwest. That would be almost a direct crosswind on runway 4 at CJR--really pushing my comfort zone. 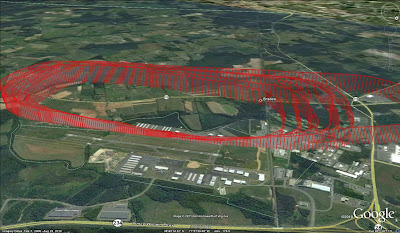 I called the examiner after the 6:35pm EST Dulles TAF was issued to touch base and run down the weather. I said that my go/no-go decision to fly would be made at the last possible moment, following the oral test, due to the projected surface winds. I prepared my flight plan and studied. I don't think I made it to sleep before 1am (not exactly what I wanted).